The tornado that caused serious damage to Naplate and Ottawa Tuesday was an EF-3 tornado, the National Weather Service reports. Natalie Martinez reports. The tornado that caused serious damage to Naplate and Ottawa Tuesday was an EF-3 tornado, the National Weather Service reports. Citing preliminary storm damage survey results, the NWS also reported a second tornado in Ottawa and one in Oregon, Illinois were EF-1 tornadoes. How Does the Fujita Scale Work? An EF-3 indicates estimated wind speeds between 136 and 165 mph and an EF-1 means wind speeds were believed to be between 86 and 110 mph. According to the data, peak winds in the Naplate-Ottawa tornado reached 155 mph, with the system traveling 11.5 miles between 4:41 p.m. and 4:59 p.m. In Ottawa alone, the EF-1 tornado hit peak winds of 110 mph, traveling 1.5 miles over a two-minute period. The Oregon system reached peak winds of up to 95 mph and traveled 1.5 miles between 5:07 p.m. and 5:09 p.m., the NWS reports. 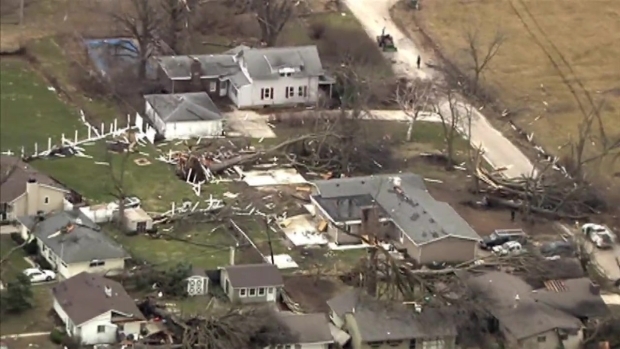 The storms left serious damage in the tiny communities of Ottawa and Naplate, roughly two hours southwest of Chicago. Homes were leveled and trees ripped from the ground, leaving four people hurt. 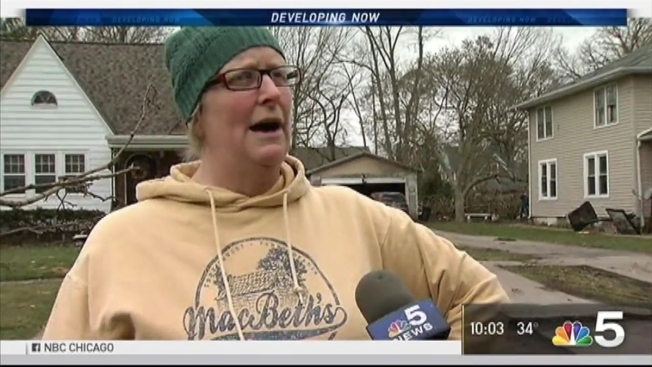 "Naplate's been devastated," Illinois Gov. Bruce Rauner said after touring the damage Wednesday morning. "As you can, I understand 64 homes are going to have to be demolished. And the blessing is that more people weren't hurt." 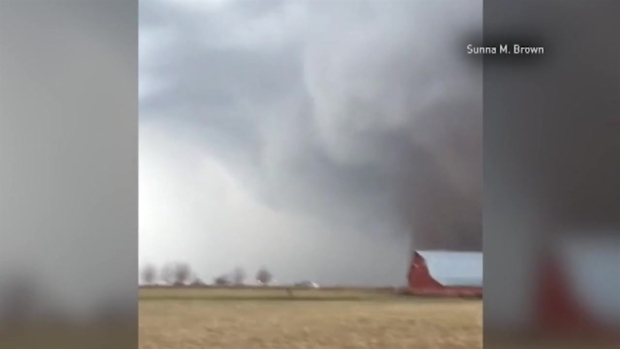 Multiple tornadoes were believed to have hit northern Illinois. An exact number wasn't immediately known as of Wednesday afternoon, but more information was expected to be released as officials continued to survey the damage. At least three people were killed in storms across the Midwest Tuesday night, including two from Illinois. One man was killed in Ottawa, about an hour and a half southwest of Chicago, when an uprooted tree came crashing down on workers on the south side of the city, police said. Family says Wayne Tuntland was a former business owner and served in the military. He was a grandfather of four who neighbors described as a "good person." 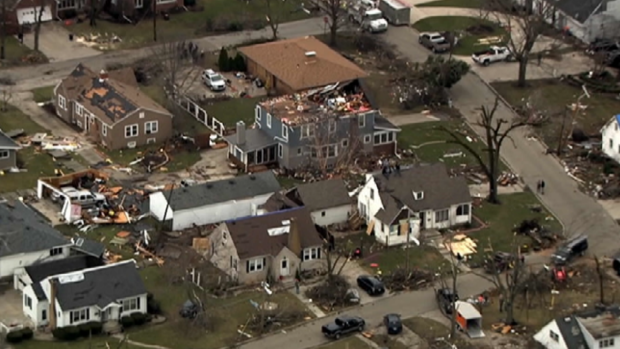 Sky 5 aerial footage shows damage after strong storms and tornadoes struck the area amid severe weather on the last day of February. Ottawa was one of the cities hit the hardest. Another man was found dead in Crossville, Illinois, more than four and a half hours south of Ottawa. A third person died in Perryville, Missouri, officials said. By Wednesday morning, there were reports of at least six tornado touchdowns in six different Illinois communities. Besides Ottawa, touchdowns were reported in Washburn, Rutland, Naplate, Marseilles and Morris. The National Weather Service says survey teams will be moving across Illinois Wednesday to catalog damage and determine the exact number of tornadoes that hit the ground. Teams will also look to determine how long tornadoes were on the ground.